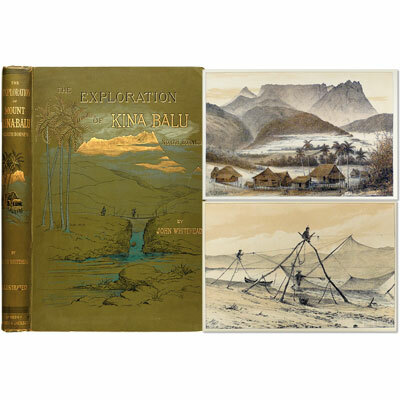 Exploration of Mount Kina Balu, North Borneo - John Whitehead 1893 - Gurney and Jackson, London - First Edition	A beautiful copy of this stunningly illustrated and unsurpassed large folio containing 32 lithographed plates, comprising 11 natural history plates, hand-coloured and heightened with gum arabic, and 21 tinted lithographed views and ethnographic subjects, and with map and an additional 21 woodcut illustrations in the text. The detailed narrative of John Whitehead's (1860-1899) travels from October 1884 to August 1888 in Borneo, Java, Palawan and Balabac Islands, especially of his three efforts (the last one successful) to ascend Mt. Kina Balu. He brought back examples of many new animals, including no fewer than forty-five new species of birds. The author's primary interest was ornithology, but he also provides much information on head-hunting, religion and custom of the peoples of the region. Besides visiting North Borneo he spent several months in Java and Palawan, and made an expedition into the state of Malacca. ‘This great travel book describes a four-year voyage to the South Pacific by Whitehead during which he not only mounted two expeditions to Kina Balu, but also carried out significant ornithological explorations in Malacca, Palawan and Java. The main objective of the trip was ornithological although other facets of zoology wre not neglected. The success of his ornithological work is attested by the fact that his collections from Borneo, Palawan and Java numbered more than 300, 150 and 60 varieties respectively including more than 50 new species. The book consists of an interesting narrative and a lengthy appendix that describes the various zoological specimens. This appendix is extracted in amended form from the articles in which the collections were originally reported. Zimmer (p. 673) summarizes these as follows: " The ornithological matter occupies pp. 200-263 and comprises three articles: an account of the Birds of North Borneo, from various articles and descriptions by the author, R. B. Sharpe, and Ogilvie-Grant in The Ibis and Proc. Zool. Soc., London; a discussion of the birds of Palawan by the author and Sharpe from The Ibis and the Bull. Brit. Orn. Club; notes on a collection of birds from eastern Java from unpublished field notes, with Seebohm's descriptions of two new species first published in the Bull. Brit. Orn. Club." Whitehead's expeditions represented the first exploration of the avifauna of Kina Balu and the article on North Borneo in the appendix is a landmark in the history of Bornean ornithology. There are six coloured plates of birds by Whitehead. Two of them are original, whereas the other four were inspired by illustrations after Keulemans in The Ibis. The remaining coloured plates depict butterflies and other insects as well as various aboriginal peoples and mammals. Most of these were coloured by chromolithography unlike those of the birds which were coloured by hand. The uncoloured lithographed plates show reptiles and different interesting aspects of the voyage including artifacts and scenic views. Whitehead, who died prematurely, in addition to being amongst the most proficient of all ornithological collectors, was also a surprisingly good artist and lithographer. Indeed, the coloured plates here of Whitehead's Broadbill and Whitehead's Trogon are absolutely unforgettable.’ - Amhurst College, Soffer Ornithology Collection. Chapters cover Malacca ; North Borneo ; Java ; Kina Balu ; Palawan ; Kina Balu, second expedition ; Appendix of zoological collections ; Scientific index . References: DNB. Jill Neate, Mountaineering Literature W58. Anker 528. Nissen, Die Zoologische Buchillustration 4394. Wood 626. Zimmer, Catalogue of the Edward E. Ayer Ornithological Library, 673. Boeknr 30929.